When it is time to work on the magazine at the office it can be stressful. Its a high dollar project that can land on up to 400,000 doorsteps. But for the same reason it is exciting. 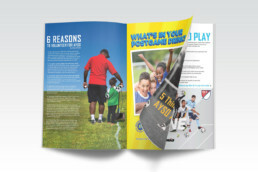 The whole marketing department, including creative services, comes together and puts its best foot forward. For my part, that includes lots of layouts. I try and and come up with three concepts for each article, and then run with what I consider to be the best option. 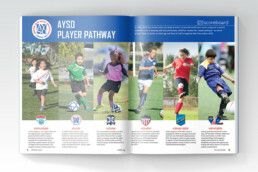 These spreads have included articles on programs, professional athletes, volunteers, and of course kids playing soccer. 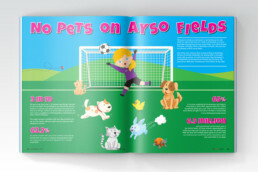 Other designs have included illustrations, infographics, and advertisements for sponsors. I just completed my first cover for the magazine, I will make sure to update and add a picture once it has gone public.